China's auto sales and Japanese vehicle output have climbed, boosting global demand for tires and rubber. Record demand for vehicles in China – the world’s largest market – and the biggest increase in Japanese vehicle production in three decades means tire manufacturers are poised for record sales, reigniting a rally in rubber prices, according to a report by Bloomberg. China’s vehicle sales exceeded the combined global total of General Motors Co. and Volkswagen AG, the world’s top two automakers, in the first half, and Japanese output more than doubled in three months as factories reopened after the March earthquake. 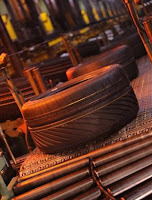 Tire demand will shrink rubber stockpiles to 12% of use in 2012, a four-year low, estimates Citigroup Inc. Prices may jump 18% to $5 a kilogram (2.2 pounds) by Dec. 31, a Bloomberg survey of 15 analysts and traders shows. According to JD Power & Associates, growing vehicle sales in China and other emerging markets will compensate for weakening demand in developed economies roiled by debt crises, giving carmakers their best year ever. After the March 11 earthquake and tsunami, Japan’s vehicle production collapsed to its lowest level since at least 1982. But that output is now resurging and reached 790,325 vehicles in July, about 1% less than in February, Bloomberg reported. JD Power estimates that global sales of cars and light commercial vehicles will rise 4% to 75.4 million units this year, and a further 10% to 83.3 million in 2012. Tire purchases will increase 6.5% to an all-time high this year and a further 5.7% in 2012, according to Arifumi Yoshida, director at Citi Investment Research & Analysis in Tokyo. Even after the slump in rubber futures since mid-February, prices are still 15% higher than a year ago and about double the average of $2.135 over the past decade. The cost of synthetic rubber surged 76% in the past year and reached $4,450 a ton on Aug. 3, the highest since at least 1997. A supply shortage will widen this year because of shutdowns and capacity constraints. Global demand for natural rubber will rise 5.3% to 11.58 million metric tons in 2012, the third consecutive annual increase, Citigroup estimates. Production will expand 5.4% to 11.59 million tons, too little to prevent a decline in stockpiles relative to consumption, the bank predicts. Production in Thailand and Indonesia, which represent 60% of global supply, is below normal, as rainfall is disrupting tapping in Thailand and trees are shedding their leaves in Indonesia, Bloomberg reported. Rubber stockpiles monitored by the Shanghai Futures Exchange stand at 33,766 tons, compared with a five-year average of 63,213 tons, data compiled by Bloomberg shows, helping to shore up prices and compensating farmers for lost output.